On the water! 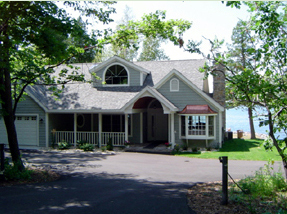 Whitecliff Harbor House, is a 4 bedroom 2 1/2 bath vacation home on the waters of Egg Harbor. Enjoy 100 of private shore with your own dock to anchor a boat and your own private view and sunning deck with spectacular sunsets. Master bedroom with a whirlpool on the main level, three bedrooms upstairs (2 queen beds and 2 twins) and a second floor sitting room with porch that overlooks the water. 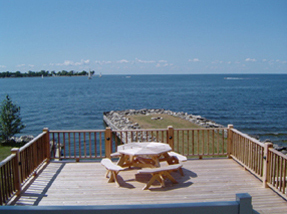 The home is located 2 blocks from the Egg Harbor public marina & village activities. 2019 Rates: $4000 weekly; $600 per night. Home Features: Master bedroom is on the main floor with king-size bed and in-room whirlpool. Three bedrooms are upstairs. Two bedrooms have queen beds and one bedroom has two twin beds. The sitting room has a queen sleeper sofa. Linens: Sheets and towels are provided. Comforters, blankets, pillows provided. Satellite dish TV is available on 4 televisions. 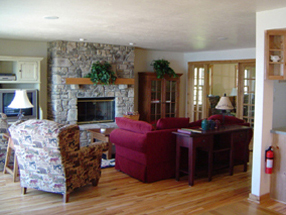 DVD/VCR player is located in the living room and upstairs sitting room. A CD player is also available. The upstairs sitting room has a porch area that overlooks Egg Harbor and the waters of Green Bay. 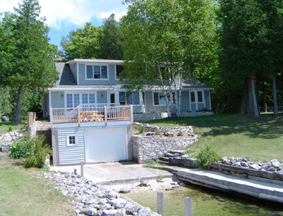 100 feet of private shore frontage includes a sunning/viewing deck with furniture and your own dock to anchor your boat. A public boat launch area is available just two blocks away at the Egg Harbor Village Marina. 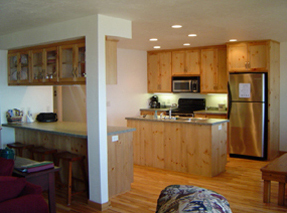 Other features of the Whitecliff Harbor House include central air-conditioning, a full kitchen that includes dishwasher and microwave, a gas grill, yard furniture and a washer/dryer. A telephone with answering machine is provided. Wireless internet in June 2010. Village has several sites with wireless. Walk to shopping, dining, a village park, and other recreational activities as the heart of the village of Egg Harbor is just two blocks away. Off-season, 2 night minimum, 3 night minimum holiday or festival weekends.